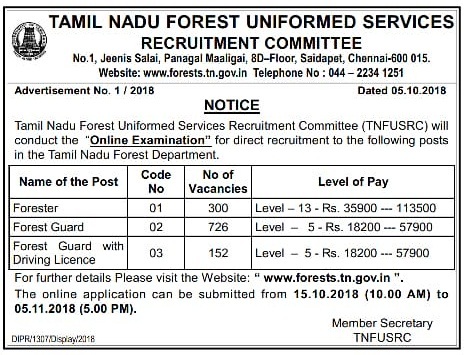 Tamil Nadu Forest Uniformed Services Recruitment Committee has Released Notification for 1178 Forester, Forest Guard Posts in its Official Website i.e., forests.tn.gov.in. All Eligible and interested Candidates can apply Online after reading complete details of the Tamil Nadu Forest Uniformed Services Recruitment Committee Recruitment 2018 | Apply Online 1178 Forester, Forest Guard Posts @ forests.tn.gov.in. careers99.com provides full details like Educational Qualifications, Experience, Job Profile, TNFUSRC job Pay Scale Details, TNFUSRC Exam Pattern, Syllabus, Age Limit, Selection Criteria, Admit Card, Results, Exam Date etc., Aspirants and Tamil Nadu Govt Job seekers can apply for Tamil Nadu Forest Uniformed Services Recruitment Committee Recruitment 2018 | Apply Online 1178 Forester, Forest Guard Posts @ forests.tn.gov.in through Online mode before the last Date i.e., 05.11.2018. Interested Job Aspirants who are ready to apply for Tamil Nadu Forest Uniformed Services Recruitment Committee 2018 Notification must possess the below-given Eligibility Details. First of all, Open Official Website i.e., forests.tn.gov.in or Below Mentioned link from careers99.com Website.